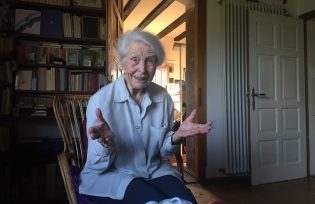 Mary de Rachewiltz from her retreat in the Italian Tyrol. A story of love and mysteries. On one day in July 1925, a poor Tyrolean woman, Johanna Marcher, gave birth in a clinic in the Italian town of Bressanone – or Brixen, as the German-speaking locals call it. It was an unusual decision for the farmer woman from the village of Gais, in Val Pusteria, but it was meant to save the child in a difficult birth. However, the doctors did not perform a cæsarean section, and the baby died. In the next room, another creature came to the world from a completely different situation: a girl, Maria, or Mary, daughter of American violinist Olga Rudge and American poet Ezra Pound, who was already married to the English painter Dorothy Shakespear. Today Mary explains: “he did not want children. Instead, my mother wanted a child from him: but she wanted a boy, mind you, and only a daughter was born: for her, it was such a shock, that she did not want me”. What to do with this illegitimate bundle? The nuns at the hospital told Olga that there was a possible nurse – that woman who had lost a child in the same days. Pound’s biographies speak of abandonment. Mary doesn’t buy it: “I must believe what my nurse Johanna told me. It was my father who immediately went with her to Gais.” Pound went to inspect the farm where the baby would find shelter. Mary has always defended her twin-track childhood, lauding the freedom and practical skills she learned in Johanna Marcher’s little hut. However, from the height of her 93 years and her blue eyes, she also remembers poverty. “There was only one door that divided the barn from the kitchen, and two chests that were also chicken coops”. Her “nurse” however was “the most admirable person I have ever met … except for my father, you understand,” she smiles. Mary de Rachewiltz also wrote this story in her autobiography, Discretions: Ezra Pound Father and Teacher, released in 1971. She tells me the story again in the Pound Room of her house, the Castelletto of Brunnenburg near Merano, surrounded by relics: paintings, instruments, even furniture built by the artisan Pound with his hands. Brunnenburg, with its crenelated towers, perched on the mountain, represents both the Tyrolean origins of Mary, and the house that she restructured with her husband, the Egyptologist Boris de Rachewiltz, and where her children grew up. The house is also a goldmine of archives of the poet, and of Mary, poet and translator in Italian not only of the Cantos, the monumental masterpiece of her father’s but of other modern poets, from EE Cummings to Denise Levertov. In Italy, a recently published volume, “Ho cercato di scrivere Paradiso,” (I have tried to write Paradise) was written by Alessandro Rivali. A poet himself, he worked many years with Mary to scrutinise the Cantos and Ezra Pound and investigate their relationship. Because this is also a love story: Pound’s love for his wife and his lover, for Italy, and the intense love between daughter and father, interwoven with laughter and intellectual life, jealousy and mysteries. At the age of ten, Mary found an oasis of stability: she was sent, almost by chance, to a luxury Florentine college; but when Italy entered the war, the funds stopped flowing to Pound and there was no more money for the fees. Mary returned to live with Olga in Rapallo. It was then that Pound suggested, with apparent nonchalance, that his fifteen-year-old daughter try her hand at translating his poetry. “He came with a copy of Curzio Malaparte’s newspaper, Prospettive, where Luigi Berti had translated a Canto. Then, he told me, ‘See if you can do better!’”. Thus began an enterprise that lasted many decades. “I would like to renew public curiosity about a poet who is often on the lips of people but in Italy is not studied enough”, says Alessandro Rivali, a poet in his own right. “And I think that from these conversations a different Pound may emerge, perhaps more human. Much is still not clear regarding Pound, and the discourse is always superficial: linked to fascism, or to economics, and little is studied about the flight of transcendence that is the Cantos “. A thorny question: in Italy, the name of Pound and fascism are still inextricably linked, also thanks to the recent extremist movement that calls itself Casapound, and that Mary de Rachewiltz has challenged unsuccessfully in court. “I do not fight anymore,” she says. “But I am sorry for the boys who believe in good faith that they can understand Pound through Italian fascism; it is completely wrong “. Pound once met Mussolini, Olga played for the dictator. Pound thundered against usury, a theme with clear anti-Semitic implications. “But in Venice, our best friends were Alis and Giorgio Levi!”. Moreover, there were the war-time broadcasts in the Italian State Radio against the United States that had joined the British in the war – speeches that in the US branded the poet as a traitor. A visionary Pound, perhaps bipolar and psychologically disturbed, obliged by posterity to wear the mantle of the political prophet, which ill befits the poet – whereas he wanted to embrace pacifism and even in these broadcast spoke, his daughter says, with his tongue in his cheek. “My father always managed to be on the wrong side”. However, the daughter also thinks of something else. “He wanted to adopt me, but by law, I would have appeared as his wife’s daughter. In 1939, he tried in vain to sort out my passport. They could not leave Italy because I could not go to America.” And that the father defended the Fascist regime also to defend her: this is a comforting thought. In 1943, Mary was sent back to Gais for her safety, to live with her nurse. After the September 8, 1943 armistice, Pound appeared in the Dolomites village, his feet injured, covered in grey dust. He had escaped from Rome to the North, with the urgent need to find his eighteen-year-old daughter, to “tell her the truth”. Finally, the secrets disappeared, as they talked until three in the morning: Mary discovered the existence of his wife, Dorothy. She later wrote in her autobiography: “I did not feel resentment, only a vague sense of pity.” Perhaps, his father told her, after the war, things would sort themselves out. Instead, Pound was arrested and spent 13 years in an asylum in the United States – where at least he could write in peace – before being released thanks to several intellectuals’ petitions. He came to see Mary in Brunnenburg, where he met his grandchildren. They had hoped for a rediscovered idyll. Instead, both the weather and the meeting were cold. Pound had come with his wife Dorothy, but also with his secretary, Marcella Spann, specifying to her daughter that he wanted a room near the young Texas woman. Too many women. “From my mother, I did not inherit talent but jealousy; I thought I would resume work with him, and I found myself managing the house instead. This Paradise did not work “. Ezra Pound died in Venice in 1972, cared for by Olga. Mary knows intimately her father’s work; she quotes him by memory. “The Cantos are so simple if you go exploring them on your own, like a child. without all the critics’ armoury.” Indeed, Pound does not appear simple to the reader – his English mixed with Italian, Latin and other languages (“To the serenissimo Dno (pronounced Domino) / and his most serena aftercomers/things, persons and omnia alia juva / whatever / the cash in the Pawn Shop / (Mount of Pity) / eiusdem civitas Senén” is for instance the beginning of Canto XLIII). However, why should poetry always be understandable? “Let people think!” Enough introductions, enough explanations: “blinkers for the reader. Why do I have to read Pound according to someone else’s interpretation? “And from the conversations of “Ho cercato di scrivere Paradiso” emerge useful elements for the Italian reader, to approach the poet, his long Italian life and his verse, without indoctrinations. Will it serve to make Pound better known to Italians? “I hope at least they will no longer say that he was a fascist and a racist”.